Sometimes, Mother Nature goes snowboarding... and when she does, high-pressure areas over the Pacific Ocean transport cold air southward to the Canadian Rockies creating a rare combination of feeder and seeder clouds. The result? Powder snow that's dryer than a Ben Stein monologue. And while it may have found its name in Northwest Colorado, Champagne Snow definitely has made its home in British Columbia, Canada's Okanagan, particularly at Big White Ski Resort. If you think 24 feet of pristine powder snowfall is amazing, take a look at what it falls on. Big White boasts over 27 thousand acres of ski-able terrain with 118 runs, 5 alpine bowls, 16 lifts, a tubing park, skating rink, cross-country trails, snowshoeing wilderness and snowmobile tracks. 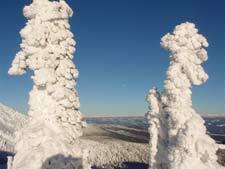 It's also home to Canada's largest ski-in ski-out resort village with accommodation for over 17 thousand guests. Glide down Main Street, step out of your bindings and step into some of the region's best coffeehouses, boutiques, bars and restaurants. Whether you're craving a hearty breakfast, après appys, a romantic dinner or a boisterous night out with friends, Big White has what you're looking for. Your truly unique winter holiday experience begins here! Big White has a dizzying number of options with something for everyone in your party. Telus Park features a 500-foot long super pipe, and a 400-foot half-pipe as well as a boarder-cross course, lots of rails and plenty of jumps. Not the downhill type? Over 15 miles of state-of-the-art groomed Nordic trails await cross-country enthusiasts looking to explore the glorious Okanagan High Country. 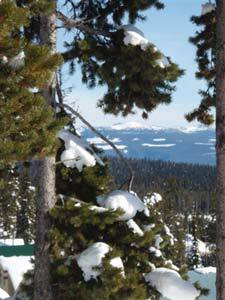 Or for a real workout, venture out on a 1.5 to 2-hour trek on snowshoes - an unparalleled backcountry experience. Make unforgettable family memories at the Mega Snow Coaster tubing park, the largest facility of its kind on the continent! Or take the tykes skating - Happy Valley has two beautiful outdoor ponds. Of course, if your little ones happen to be a little older, take them for the ride of their lives with Snowmobile Adventures on a guided tour through the scenic forest trails. 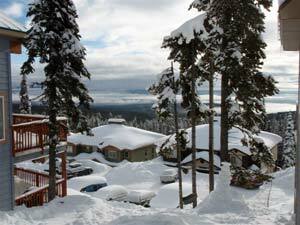 At Big White, it's appreciated that sometimes a holiday means a little time away from the kids, as well. That's why support services are offered for all ages, infant to teen. The Tot Town Day Care keeps youngsters busy all day with a mix of indoor and outdoor activities. The Big White Kid's Centre Kids Ski School has been voted the best in the entire country with over 100 qualified instructors teaching private and group lessons for skiers and snowboarders. And while the youngsters are occupied, Mum and Dad can treat themselves to some relaxing and well-deserved pampering at their choice of 2 top-quality day spas. Each offers broad range of luxury treatments including massages, facials, manicures, pedicures (come on Dad, try it! ), haircutting and styling. Yes, the champagne snow at Big White has a magical uniqueness about it. But then again, maybe that goes for everything here.